In modern laboratories, workspace is at a premium. More technicians, equipment and increased workloads don’t necessarily mean safety has to be sacrificed, especially when it comes to dangerous biohazard contaminants that may be left behind in the lab. What is our real solution to this real problem? Whitney Medical Solutions' Safe-Keepers. 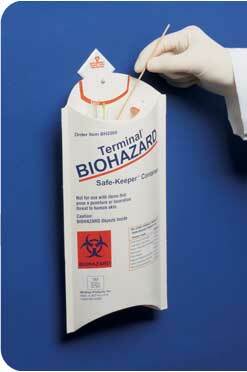 Dispose of biohazardous waste and save valuable bench top space with our hangable and leak-resistant Safe-KeeperTM. Lab technicians can collect biohazardous waste right at their workstations without cluttering bench tops. Made of sturdy plastic-lined paperboard and prominently labeled with orange biohazard symbols, the Safe-Keeper has a unique solid-bottom design, unlike other look-alike products. The solid bottom construction keeps contents from leaking or falling out. When full, the Safe-Keeper can be autoclaved or incinerated with contaminated materials inside the container, then disposed of according to local, state or federal regulations. Safe-Keepers are shipped flat to save space and set up easily for use. Each case comes with a Hook-Up™ self-adhesive hook so Safe-Keepers can be easily hung on the wall or a shelf, keeping bench tops clear. Additional hook-ups suitable for keys, lab coats, goggles, etc, are sold separately. Discover for yourself the convenience of our innovative lab products by requesting a free sample today. Just tell us where to send your sample! It’s that easy.